Order your own copy of Daggers in the Dark at your local retailer or online through our website today! Winter has come to Westeros. At the Wall, the brothers of the Night’s Watch constantly question the demands of their Lord Commander, Jon Snow, pondering the demands of their duty and those of their morality. In King’s Landing, the Tyrells, Lannisters, and the newly restored Faith Militant divide the smallfolk as the city becomes a powder keg about to explode. And in Essos, Tyrion makes his way to meet Daenerys Targaryen, not knowing that she has flown from the fighting pits on the back of Drogon and the harpy’s city is now without a queen. Now is the time for those who dwell in the shadows to strike back against the light. 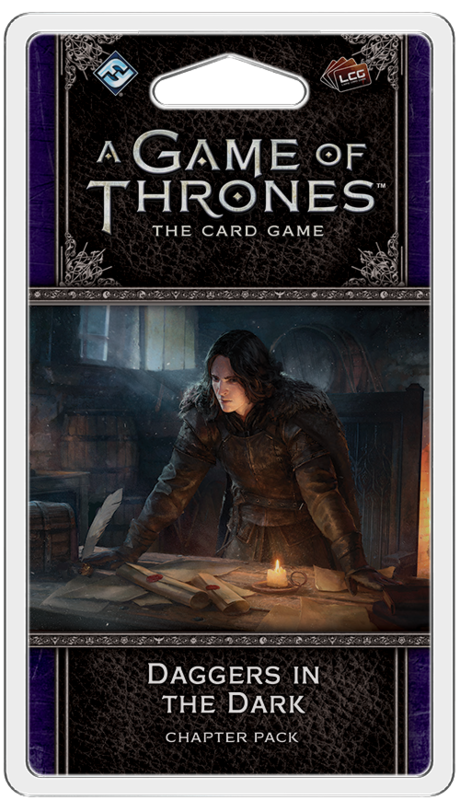 Fantasy Flight Games is proud to announce Daggers in the Dark, the sixth Chapter Pack in the Dance of Shadows cycle for A Game of Thrones: The Card Game—now available for pre-order at your local retailer or online through our website! Daggers in the Dark draws you into the last pages of George R.R. Martin’s A Dance with Dragons, where the fight for the Iron Throne has left the battlefields behind, and now emerges in deadly plots where it is nigh impossible to tell friend from foe. 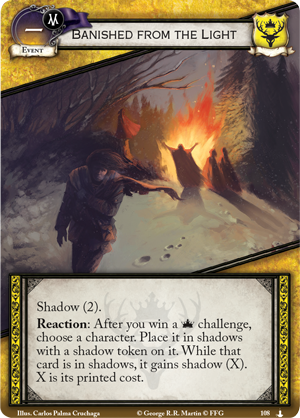 In the grand conclusion of the Dance of Shadows cycle, you are given new ways to form strategies and lay your traps with the continual development of the shadow keyword. 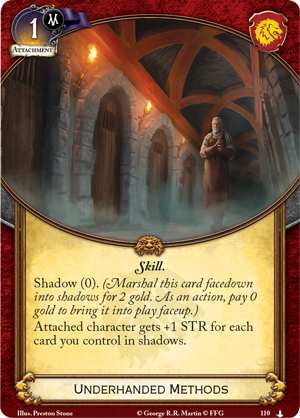 For the price of two gold, you can play cards with the shadow (x) keyword facedown into shadows, keeping them safely hidden until the opportune moment to reveal them. With this keyword, you can build strategic plans with more security than ever before, with the near certainty that so long as your cards remain under the shroud of shadows, they are safe. This Chapter Pack is designed to delve deep into darkness, with new events that can only be played from shadows and effects that can even push less nefarious cards into the gloom. Banished from the Light (Daggers in the Dark, 108) lets you move any character to shadows, even if they don’t have the new keyword. You may return one of your own cards to shadows, safeguarding it from harm. Or, you may return one of your opponent's characters to shadows, forcing them to pay a hefty price if they want to bring their character back to the light. Either way, the dark plots you're enacting require careful planning. The brothers of the Night’s Watch are all too familiar with the need for quiet plotting with their event, Daggers in the Dark (Daggers in the Dark, 106). 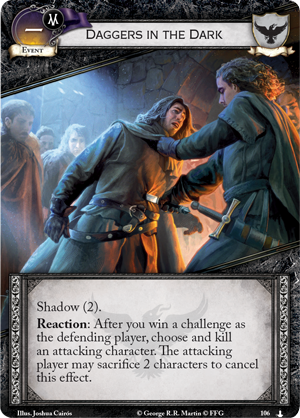 When you command the Night’s Watch you may use this card, paying two gold to reveal this event and kill an attacking character once you successfully defend your order. The attacking player may sacrifice two characters to cancel this effect, but blood will undoubtedly be shed and your opponent will be forced to question if one life is worth more than the cause of their House? In Daggers in the Dark, you will also find a variety of cards that become stronger as the shadows stretch longer. 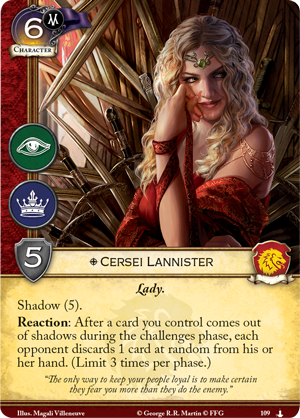 The Lannisters’ Underhanded Methods (Daggers in the Dark, 110) increase a character's STR for each of their cards in shadows—and the fact that you can play this attachment from shadows for free, at any time, makes it easy to tip a challenge in your favor. 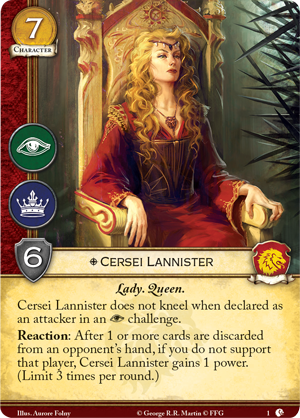 Then, once your plans have ripened and you are ready to spring your trap, you can call upon Cersei Lannister (Daggers in the Dark, 109), whose recent experiences with the Faith Militant, the Tyrells, and even her uncle Kevan have only increased her viciousness. 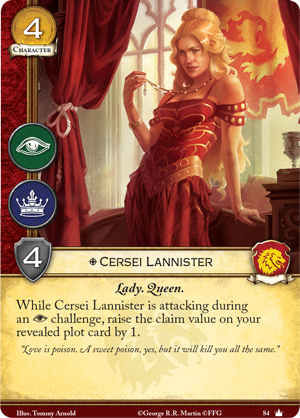 Changing from her original version (Core Set, 84) in the Core Set and her second variant (Lions of Casterly Rock, 1) in Lions of Casterly Rock, Cersei has gained the shadow keyword and a new ability to dismantle her enemy’s plans with her own. During the challenge phase, for each card you bring out of shadows, your opponent must discard a random card from their hand. 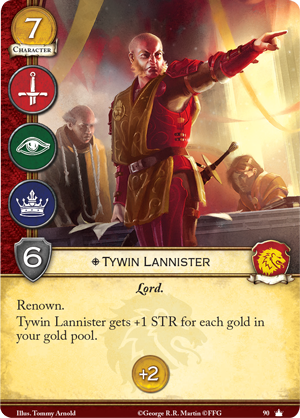 With the Lannisters’ caches of gold in Casterly Rock, it will be a simple matter for you to store a hoard of cards and play them all at once to shred your opponent’s hand and any hope they have for success. The lords and ladies of Westeros may spin their webs of treachery and deceit, but none compare with the Spider himself, Varys (Daggers in the Dark, 119). You may choose to marshal him normally, but the Master of Whisperers’s true strength comes from the underhanded shadowplay that has run throughout the entire Dance of Shadows cycle. 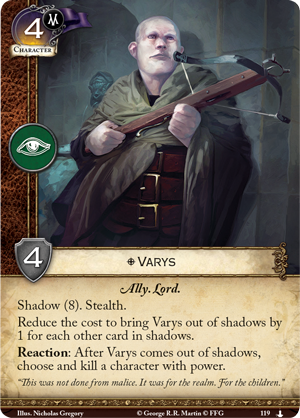 While Varys has a shadow cost of eight, this is reduced by one for each other card in shadows, regardless of whether they belong to you or your opponent. Then, after Varys comes out of shadows, you may choose and kill a character with power. No matter which House you're pitted against, you can effortlessly remove one of their key characters from the board, taking any power that they had earned with them. 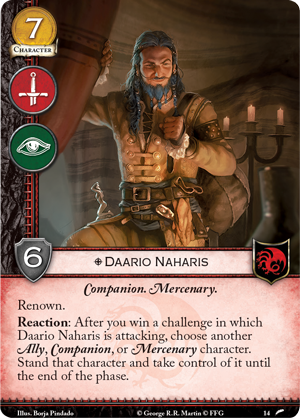 Should you wait until your enemy is on the threshold of victory and use the Spider's ability to murder a key renown character like Daario Naharis (The Archmaester’s Key, 14) or Tywin Lannister (Core Set, 90), the blow is sure to be nothing less than devastating. 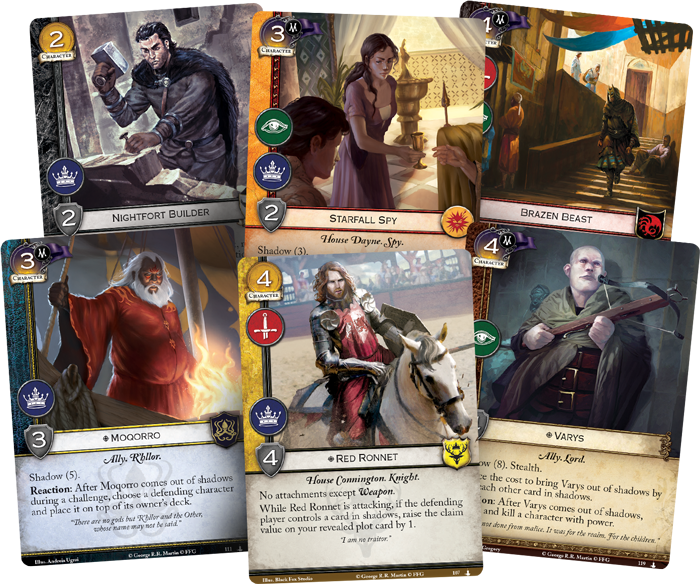 The last light of the sun is about to leave Westeros and after the War of the Five Kings, few are set to survive the long nights ahead. The realm is on the brink of total collapse and you can no longer afford the luxury of scruples. Do you have the strength to do what must be done? Pre-order your copy of Daggers in the Dark (GT36) at your local retailer today or online through the Fantasy Flight Games website here!